Windows Live SkyDrive is Microsoft’s service that lets you store any file virtually on an online folder which has a capacity of 25GB. The service is free of charge and you can then access the folder from anywhere, from any PC or Mac. Microsoft has introduced the future of cloud storage but there isn’t a proper guide on how to access the drive from Windows 7 Explorer, well here we have it. Once you have complied by the above requirements follow these simple steps which won’t take longer than 5 minutes. Step 1: Obtain your unique Windows Live ID. This ID is not similar to your Windows Live Login credentials. 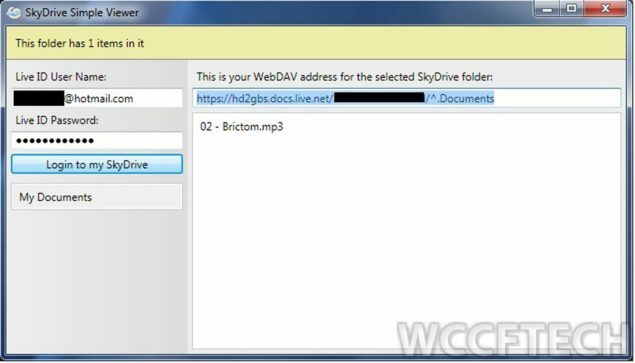 In order to obtain it open SkyDrive Simple Viewer for WebDAV provided above and use your Windows Live login credentials. Step 2: You will now see a list of folders on your SkyDrive. Open the folder you want to map and copy the URL from the dialog box on the top right. Step 3: Now comes the easiest part. Open Start Menu and right Click on My Computer. Select Map Network Drive. Paste the URL you copied in Step 2 here and wait for a couple of seconds. You might be asked to enter login credentials. Enter your Windows Live Login credentials here (NOT Windows 7 credentials) and continue. The SkyDrive folder will now show up in Windows Explorer (My Computer) just like other hard drives and you can manage it from there. Mapping the whole drive: If you want to map the entire drive and not any particular folder then in Step 3 just add the URL till your unique id and erase the folder name. For example add https://hd2gbs.docs.live.net/ab0c2b20e……./ only. Remove Mapped Folder: In order to remove mapped folder simply right click the folder in My Computer and click disconnect. This method is known to work on Windows 7 only. If it works on other version of Windows then do let us know.